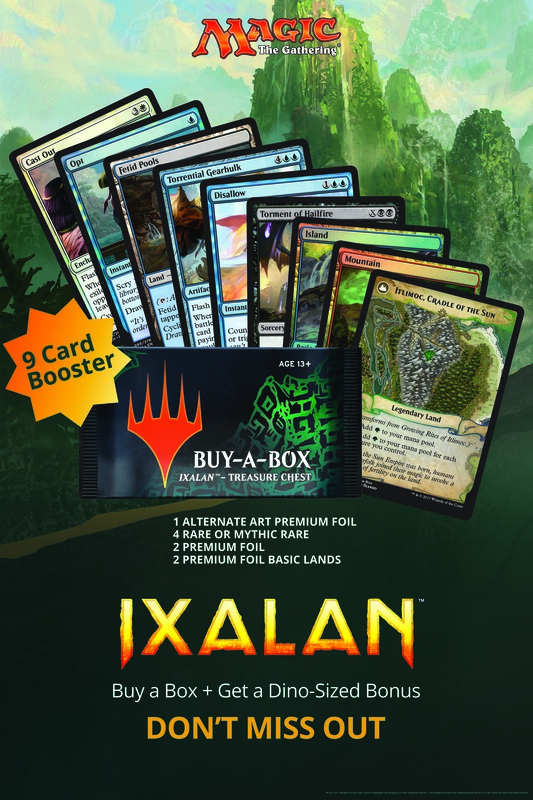 Get the word out now: starting Black Friday (11/24), players who pick up a box of Ixalan get five bonus rares, a handful of bonus foils, more Rebecca Guay lands and an exclusive alternate-art transform land from Ixalan. That's a minimum of 14% more rares per box, plus foils and a handful of exclusives not found in any Magic SKU and available only in WPN locations. Between November 14 and 20, WPN stores of Core level and above will automatically receive** Ixalan Treasure Chest packs to give to any customer who picks up a full display of Ixalan (limit 1 per customer). Each pack contains a foil copy of one of the transform lands from Ixalan. These are randomly inserted—it could be Growing Rites of Itlimoc/Itlimoc, Cradle of the Sun, Vance's Blasting Cannons/Spitfire Bastion, or any of the other eight Ixalan transform lands. These are also randomized and could be any card printed between Kaladesh and Ixalan. These lands are also featured in Ixalan Standard Showdown packs and Ixalan Special Buy-a-Box packs. These are randomized and could be any rare or mythic from any set from Kaladesh through Ixalan. *The cards pictured above are for example only. Actual contents vary between packs. **APAC retailers: Check with your local Wizards representative for distribution details. Go here under "Flyers and Posters" to download a poster and a shelf-talker to advertise the promotion in your store. Put the poster wherever it'll draw the most attention and the shelf-talker below your Ixalan product. Wizards is supporting the promotion online with the ads below, and you can help boost the signal by dropping them in your social media channels. Download them here under the "Social Media" tab. Drop them on social media repeatedly in the run up to Black Friday and afterward. Between now and the 24th, we've got Iconic Masters Drafts, PPTQs for the second Pro Tour of 2018, plus FNM and Standard Showdown. Take a moment in your announcements to make sure everyone knows: while supplies last, Ixalan boxes come with at least 14% more rares, plus foils and exclusives. Black Friday is a little over two weeks away. Between then and now, download our social media ads, put these posters in your store, and get the word out at your events.